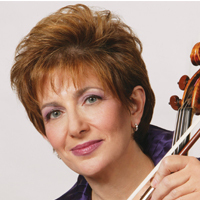 Ida Kavafian has performed extensively as soloist; as Artist of the Chamber Music Society of Lincoln Center; co-founder of TASHI, Trio Valtorna, OPUS ONE, and Bravo! Colorado in Vail; artistic director of Music from Angel Fire for 33 years; former member of the renowned Beaux Arts Trio; and holds the Nina von Maltzahn Chair of violin studies at the Curtis Institute, Juilliard School, and Bard College. She has premiered, toured, and recorded many new works by such diverse composers as Tōru Takemitsu, Michael Daugherty, Chick Corea, Wynton Marsalis, and Mark O’Connor. She has also found great success with her hobby, raising prize-winning purebred Vizsla dogs.